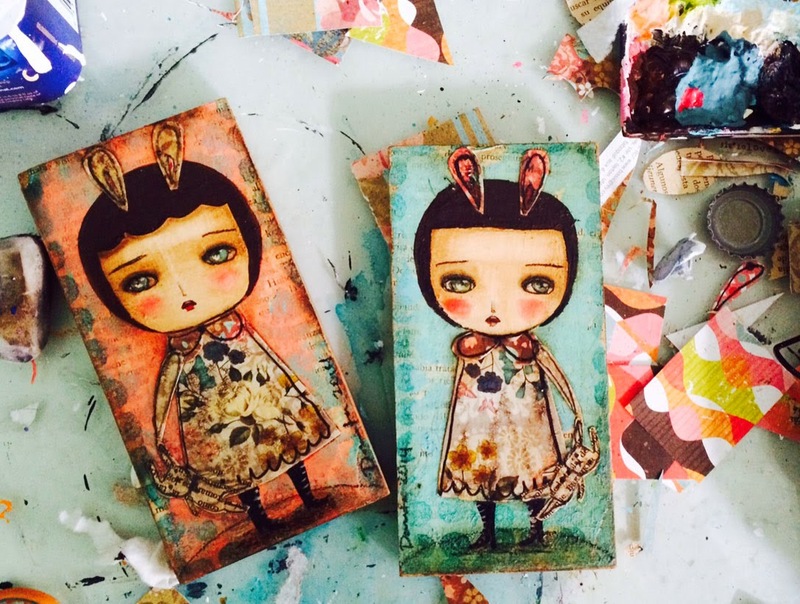 Still under the bunny bug: Two new mini paintings! I've been working a lot on commissioned pieces lately and I managed to squeeze 2 little paintings of my own there. I love doing commissions but I also love the freedom to put whatever I want on my canvases, so I take a little bit of time to do some paintings of my own. These two are the results. I love bunnies and they have a very personal meaning to me, so I can't let the season pass without put them everywhere. I already made dolls and now it was the paint turn. My weekend was half scary and half exciting. First my daughter was so sick we had to take her to the E.R. She's as if she wasn't seek at all now (amazing how children heal!). That was the scary part. The exciting one is that I went back to my pottery classes!!! Yay for that!, they make me happy (and very frustrated too), but mostly happy. I'll show you my pieces when there's one worth showing. Meanwhile, lets keep making rabbits! I am very sorry about your daughter being sick, but I also smile at the fact that she is better now. Loved the way you pictured the rabbits in your painting, but also their shapes and expressive features.